Where: Coombe Wood, Conduit Lane, CR0 5RQ Croydon, United Kingdom. For more information on Coombe Woods click here. When: Every second and third Monday of the month, at 10 am - with plans to resume weekly in the pipeline. 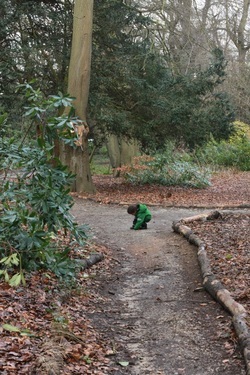 As Nature Play is child led, the finishing time depends on when it feels right for you to leave. Depending on weather, food provisions, energy levels, etc you might want to stay for longer or head home earlier. Meeting point: At the end of the Broad Walk just before the entrance to the woods. Please check the map at the bottom of the page, where the meeting point is marked with a red dot. What to bring: Please bring a small healthy snack to share, a cup for tea, picnic blanket and wet weather gear if it’s raining. Bring your packed lunch if you plan on staying later. What to expect: We will head into the woods from the gardens walking by some beautiful tree and shrub specimens and depending on the season different types of flowers. There are plenty of tree branches and pine cones to collect and some amazing tree formations for the children to play in. We will set base at a small valley within two hills to have a drink and snacks where the children can continue to explore their surroundings. Toilets: Available near the stable block with a separate disabled access toilet and baby changing facilities. Once in the woods there are leafy private areas where you can find a tree if needs be. Route 3, alight at Lloyd Park or Coombe Lane stops, both of which are a 10 minute walk from the site. Public Footpath & Bridleway No. 575 runs along Conduit Lane and links to Croham Valley Road. The wood is located in Conduit Lane off Coombe Road (A212), there is parking in Conduit Lane, opposite main entrance and Oaks Road.